With Thanksgiving just a couple of weeks away, I have started to plan out my menu. My mom is in charge of making the turkey so I normally bring a couple of side dishes and a dessert or two. This year I wanted to break from tradition and make something that I know the whole family will love. Just this past week I decided I would be making Baked Cheddar Ranch Potatoes Of course I had to “test” it out with the family before the big day, just to make sure it was something that was holiday worthy. First thing you need to do is wash your red potatoes very good. Make sure you scrub the skin so there is no dirt on them. Next dice the red potatoes into 1-1 1/2 inch pieces. Fill a large pot with water and 1 tsp salt. Add the Red Potatoes. Let the potatoes come to a boil then cook at a low boil for 10 minutes or until the potatoes are soft enough to poke a fork through them. Drain the potatoes well. Put the potatoes back into the pot and add 1 cup of ranch dressing, 1 cup of cheddar cheese, 1 tsp salt, 1 tsp pepper and 1 tsp seasoning salt. You can use any brand of ranch, but here is the ranch that I prefer and think tastes the best. Mix together well, but make sure not to stir hard or you’ll end up with mashed potatoes. 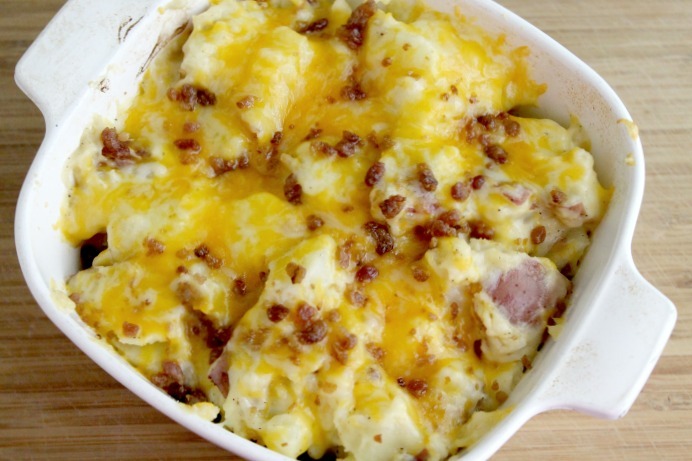 Place the mixed potatoes in greased casserole dish and top with the remainder cheddar cheese (1/2 cup) and 1/4 cup diced bacon. Place the cheddar ranch potatoes in a pre-heated oven at 350 degree for 8-10 minutes or until the cheese is completely melted. I’m telling you, I may never go back to plain mashed potatoes again. 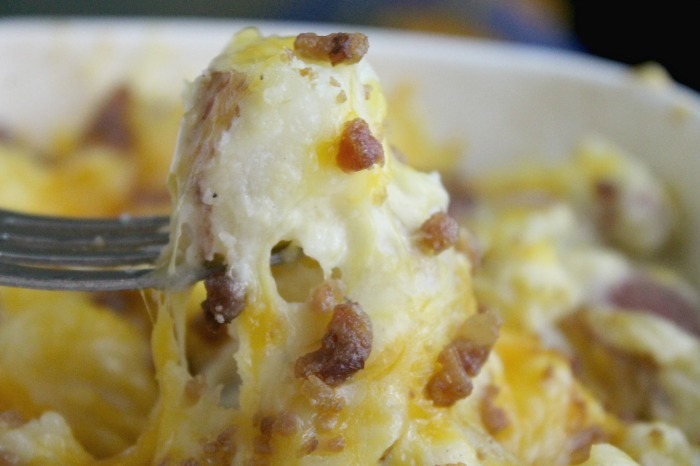 These Baked Cheddar Ranch Potatoes are amazing and the best part is, they are so easy to make! Are you suppose to cook the bacon before you put it in the potatoes? Can you use salad ranch dressing from a bottle ? Is it ranch salad dressing or the ranch salad dressing dry mix?